GFE4400 2D engine provides a compact and easy-to-use solution for OEM use in self-service kiosks, price verifiers, ticket readers, document handling and medical laboratory applications, as well as vending machines and other automated equipment. 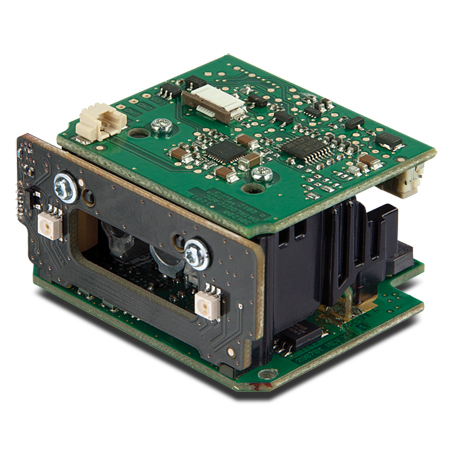 The GFE4400 2D OEM engine features outstanding near-field reading, a wide angle field-of-view, high motion tolerance, snappy reading, and also offers excellent performance on decoding poor or damaged bar codes. As with all Gryphon readers, the GFE4400 2D OEM engine offers good-read visual confirmation with Datalogic’s patented ‘Green Spot’ technology. User comfort is maximized with the GFE4400 2D OEM engine’s steady, deep red illumination light. Easier on the eyes than competitive products with flicker illumination, the highly visible 4-Dot aimer defines a precise reading zone and reduces accidental reads. The aimer’s center cross provides a locator for targeted scanning in a multiple bar code environment. The GFE4400 2D OEM engine provides snappy reading performance on all common 1D and 2D codes as well as postal, stacked and composite codes like PDF417. For mobile marketing or ticketing applications, this imager also offers excellent performance when reading bar codes from mobile devices. The GFE4400 2D OEM engine eliminates the need for separate equipment with signature capture and document scanning capabilities. The GFE4400 2D OEM engine supports several modes that can be used as a trigger. This module has the ability to automatically sense objects and trigger itself. A continuous scan mode captures data whenever a bar code passes into its field-of-view. The reader can also be triggered remotely through software commands or via hardware input from programmable logic controller (PLC) or sensor. The GFE4400 2D OEM engine supports an RS-232 serial interface, a USB HID Keyboard and a USB COM interface.